New research led by University of Otago scientists indicates there is increasing evidence that whale and dolphin watching activities can have detrimental effects on the populations they target. The study Behavioural responses of spinner dolphins to human interactions has been published recently by the Royal Society Open Science. Researchers from Italy, Hong Kong and the Falkland Islands also contributed to the study, alongside Dr. Maddalena Fumagalli and Professor Liz Slooten of the University of Otago's Department of Zoology, plus Professor John Harraway of Otago's Department of Mathematics and Statistics. 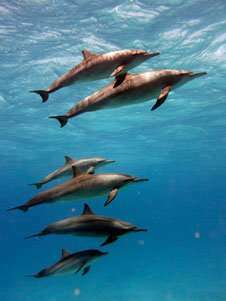 The research focused on populations of spinner dolphins off the coast of Egypt, where there is a variety of regulations concerning tourist interactions with dolphins between different areas. The study focused on three areas, one with no tourism, one with controlled, and one with uncontrolled tourist activities. Lead author Dr. Fumagalli, who conducted the research as part of her Ph.D. at Otago, says this provided an ideal experimental setting, as the inclusion of a control site where there was no tourism provided a comparison of the effect of tourism on the dolphins at the other two locations. "This species displays a particular ecology, with resting and sleeping confined to the daylight hours and the shallow, protected, waters of reef's lagoons. Our findings showed that human interactions in these lagoons caused disruptions to the dolphins resting patterns," says Dr. Fumagalli. She adds that at Samadai Reef, where there are restrictions on how close boats and swimmers are allowed to approach the dolphins' resting area, the rest needs of the dolphins appear to be met. However the situation at the site of unlimited tourist access is "worrisome." "Where activities are not regulated, dolphins may find it impossible to rest. This is cause of great concern because the repeated sleep and rest loss can affect the well-being of the animals, and lead to reduced efficiency in feeding, defence, mating and nurturing, among others, eventually resulting in population decline or displacement," says Dr. Fumagalli. While this study concentrated on dolphins off the coast of Egypt, Dr. Fumagalli says that her knowledge of and exposure to the New Zealand situation was also important. The idea that these countries can benefit from each other's lessons learned is summarised by Professor Slooten. "While Egypt can learn from New Zealand in terms of limiting the number of boats and visits, licences, and codes of conduct, New Zealand can learn from Egypt in terms of the area-based approach, with zones for boats, zones for swimmers and zones with only dolphins," Professor Slooten explains. "It is time to act upon the scientific evidence on the effects of dolphin watching on wild animals. The literature on this topic is abundant and clear. We should discourage any unregulated increase in dolphin tourism and recommend to apply a precautionary principle to ensure full protection to dolphin groups while they engage in critical behaviours such as calving, feeding and resting, and well before impacts on individuals become evident and populations are compromised. In the Egyptian case, a science-informed management scheme including a time-area closure system was very effective in safeguarding the dolphins' resting needs while allowing tourism fruition," Dr. Fumagalli says. Dr. Fumagalli says that dolphin watching can be a great experience provided it is carried out with respect and a basic understanding of the animal's behaviour and, most of all, it is initiated and led by the dolphins themselves. She recommends regulations be designed on a case-by-case basis, and where regulations are missing or compliance is low she urges representatives and legislators to design new management schemes and monitor their efficacy.